You are here: Home / About Farming & Food / What is a GMO? The term GMO gets tossed around like a dirty word. What have you heard about GMOs? Do you know what they are? Find out what a GMO really is here. GMO stands for Genetically Modified Organism. Technically, that means any organism that has had a change to its DNA. So, something like the red grapefruit, which has had its DNA altered through mutagenesis (creating random mutations) to have a different color, is technically a GMO. And seedless watermelons, which were created by breeding different types of watermelon to get one with a different number of chromosomes (or amount of DNA), is also technically a GMO. However, when most people talk about GMOs, they are talking about an organism (typically a plant) that has had a gene from a different species added in a lab. This is done through genetic engineering (sometimes called bioengineering), a type of biotechnology. For which the modification could not otherwise be obtained through conventional breeding or found in nature. When I talk about GMOs on this website, I’ll be talking about what most people think of as GMOs. Plants (or animals) that have had their genes modified using transgenesis or cisgenesis (see below). As of September of 2016, there are 9 foods that are available in genetically modified versions. To break this down a little more, let’s get some definitions. These will come in handy as we talk more about GMOs. Although the word “acid” makes this stuff sound scary, most people know deoxyribonucleic acid as DNA. Every living thing has DNA. DNA is made up of a series of genes. Each cell in your body has a full set of DNA, arranged in long strings called chromosomes. The full set of chromosomes is called a genome. Genes make up our DNA. A gene is a set of nucleotides (building blocks) in a certain order. There are only 4 nucleotides – adenine (A), cytosine (C), thymine (T) and guanine (G). These nucleotides can be arranged in many different combinations, based on how many are in each gene and what order they appear. Each gene codes for one protein. The order and number of the nucleotides determines what protein the gene codes for. A protein is a set of amino acids (building blocks) in a certain order and shape. Each protein is made up of a number of amino acids. There are 20 amino acids that make up every single protein. The order and number of the amino acids determines what the protein looks like and what it does. Okay. So nucleotides make up genes. And genes make up DNA. The full set of DNA that makes a person (or a plant, or an animal, or a bacteria) what it is, is called a genome. The genes code for amino acids, and the amino acids make up proteins. So far, so good. Now it gets a little complicated. A transgenic organism is a living thing that has “extra” DNA from another living thing. Specifically, one or more genes from a different species have been inserted into the DNA of this transgenic species. An example that you have probably heard of is Bt corn. Corn has its own genome. In fact, each variety of corn has its own genome – the genome of sweet corn is different from the genome of popcorn, and that is different from the genome of field corn. Each hybrid of corn also has a different genome. The Bacillus thuringensis bacteria also has its own genome. Some of the genes in Bt code for proteins that are poisonous to some insects. A cisgenic organism is a living thing that has “extra” DNA from the same species or from a closely related species (that could naturally breed). An example of this is the Innate Potato, a newly-approved GMO potato that will not brown after it is peeled and has decreased bruising. These cisgenic potatoes use genes from a different variety of potato to turn off the enzyme that causes browning and black bruise spots. It’s not very easy to talk about GMOs. There are a lot of different words used to describe the same things, and there aren’t very clear definitions. A lot of complicated science has gone into developing this biotechnology, and it can be very confusing. I’m going to dig into GMOs and the science behind them in a series of posts on My Fearless Kitchen. You’ll be able to see all the posts that talk about GMO posts in the header above. Click on “About Food & Farming”, then click on “About GMOs” to see everything I’ve written here. 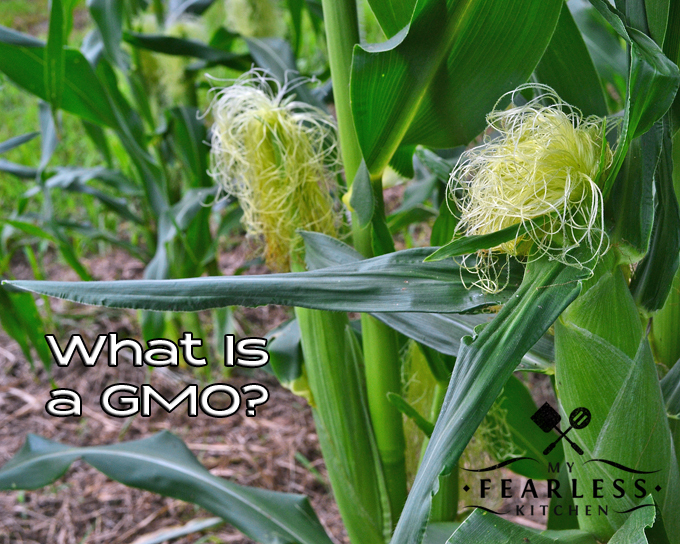 What other questions do you have about GMOs? Check out these resources on My Fearless Kitchen and this article from GMO Answers. Leave me more questions in the comments! « What is the Best Meat to Grill?